The origins of acupuncture can be traced back 2,500 years or more. The writings of ancient Chinese practitioners delineated the pathways of the channels of communication that flow throughout the body. They also described the elegant theoretical framework that enables modern practitioners of Oriental Medicine to diagnose patterns of disharmony that cause disease. Instead of taking the body apart and learning how to fix it piece by piece like a machine, the Chinese understood the body as a complex, integrated ecosystem. Body, mind, and spirit were treated simultaneously as an interrelated whole. This perspective has lead to the development of a unique method of treating pain and disease that is remarkably safe, noninvasive, and free of dangerous side effects. Acupuncture is being rapidly accepted as an effective alternative medicine in the United States. Acupuncture treatment was almost unheard of in America prior to President Nixon's visit to China in 1972. Currently acupuncture has been successfully used by millions of American patients to treat pain and disease. Acupuncture has not only survived the scrutiny of western science and controlled, double-blind studies, it has been endorsed by a National Institutes of Health consensus committee for use as treatment for many health disorders. The NIH consensus statement says that "while it is often thought that there is substantial research evidence to support conventional medical practices; this is frequently not the case. This does not mean that these treatments are ineffective. The data in support of acupuncture are as strong as those for many accepted Western medical therapies." The NIH also points out that "the occurrence of adverse events in the practice of acupuncture has been documented to be extremely low." Pain relief often begins immediately after the insertion of the first few needles. Many patients are surprised to find that even long-term pain that has persisted after several surgeries, pain killing drugs, and antidepressants can be quickly and simply reduced and eventually cured. Pain from recent injuries usually requires a smaller number of treatments and chronic conditions need a longer series of treatments, but in most cases acupuncture goes far beyond simple pain relief. These treatments trigger a healing response in the body that can completely heal many conditions. Your first visit to our clinic starts by filling out a medical history form and an informed consent sheet. Chinese medicine looks at the whole person and not just specific symptoms so the initial interview may ask a wide variety of questions about general energy level, sleeping and eating habits, and feelings of heat or cold. If you are a healthy individual with a specific pain issue like tendonitis, frozen shoulder, or knee pain we will discuss the onset, location, and quality of the pain. To determine the best course of treatment we will examine your tongue and pulse for diagnostic signs. This examination takes longer and is quite different than a Western Medical pulse assessment. A Chinese pulse and tongue diagnosis can reveal a patient’s constitution, current organ imbalances, excesses, weaknesses, deficiencies, and stagnations. It often allows insight into physiological weaknesses and imbalances even before they manifest as disease. Because most modern acupuncture schools do not adequately teach Chinese pulse diagnosis this skill has almost become a lost art. We have invested time and efforts to refine this expertise through post graduate study with certified teachers of the Shen/Hammer system of Contemporary Pulse Diagnosis. When the diagnosis is complete we can start the treatment process. With most of our patients treatment starts with acupuncture, but there are several other possible options including acupressure, herbal medicine, and nutritional counseling. Before the first few treatments we will discuss how acupuncture works and how it differs from Conventional Western Medicine. We will evaluate your response to these first initial treatments then we will set up an individualized treatment plan. We encourage questions and suggestions from our patients. If you don't understand a particular technique or type of treatment, just ask. Acupuncture treatment begins with the patient getting into a comfortable position. We often palpate specific points on the body and ask the patient for feedback on their tenderness or sensitivity. The selected points are wiped with antiseptic alcohol and the needles are inserted. The needles may be left in place 20 minutes to an hour depending on the condition being treated. How does acupuncture feel? Unlike hypodermic needles, acupuncture needles are solid and hair-thin. An acupuncture needle can be inserted into the hole of an ordinary hypodermic needle with room to spare. Acupuncture needles are also not inserted as deeply as hypodermic needles, generally no more than a half-inch to an inch depending on the type of treatment being delivered. While each person experiences acupuncture differently, most of my patients tell me that they feel only a small mosquito bite sensation as the needles are inserted. Some people reportedly feel energized, while others feel so relaxed that it is not uncommon for patients to fall asleep during the treatment. If you experience any momentary pain or burning sensation from the needles let us know so that we can adjust the treatment plan or needling techniques to fit your level of sensitivity. Patients often notice improvement in their condition with the first treatment, but with most cases it takes a series of treatments to make significant, long-term improvement. Pain from recent strains or injuries usually requires a smaller number of treatments and chronic conditions need a longer series of treatments to produce a lasting cure. Recurrent conditions like menstrual pain or PMS need to be evaluated on a monthly basis and usually need a few months for treatment. It is important to remember that in most cases acupuncture goes far beyond simple pain relief. These treatments trigger a healing response in the body that completely heals many conditions. How does acupuncture work? I see such remarkable responses to treatments that I wonder about this everyday. I had a patient with a frozen right shoulder who had a previous operation on her left shoulder for a similar problem and it had taken months of physical therapy to heal. She could only raise her right arm to a point just below her shoulder before it locked up. It would go no further. I inserted one needle in her leg and asked her to gently raise her arm. She was shocked to find out that she could now raise it all the way over her head! After several treatments her shoulder was back to normal. I know that her shoulder remained better for many because she continued to send me new patients for many years. Since then I have successfully treated many frozen shoulders. The patients have a variety of different Western medical diagnosis like tendonitis, bursitis, thickened synovial fluid in the bursa, rotator cuff damage, adhesive capsulitis, and arthritis. From the perspective of Chinese medicine they all have a blockage or an imbalance in their channels (often called meridians). My acupuncture training allows me to find key points that rebalance that blockage and resolve their problem. The success of the treatment proves that my diagnosis was correct. I find it difficult to believe that inserting one needle in the leg suddenly reduces inflammation in the tendons and bursa, removes adhesions, or instantly thins the synovial fluid. Perhaps a better Western Medical diagnosis for frozen shoulders would be a feedback dysfunction in the Gamma efferent system. This part of the nervous system provides feed back to keep muscle groups balanced and with in limits so that they do not break bones or tear out tendons. Western medical researchers have advanced many theories to explain how acupuncture works. One theory suggests that pain impulses are blocked from reaching the spinal cord or brain at various "gates" to these areas. Another theory suggests that acupuncture stimulates the body to produce narcotic-like substances called endorphins, which reduce pain. Other studies have found that other pain-relieving substances called opiods may be released into the body during acupuncture treatment. Unfortunately, these theories don't even begin to explain the instant change in my shoulder patient. After she raised her arm she told me, “It wasn’t pain that kept me from raising my arm. It was just locked up.” These theories also fail to explain how acupuncture can successfully treats many conditions besides musculoskeletal or pain disorders including stabilizing blood sugar levels, reducing cravings of addictions, treating conditions like asthma, PMS… and more. There is one recently developed hypothesis about acupuncture that begins to explain how it works in a way that makes sense of the results I see in my clinic. It is called the Morphogenetic Singularity Theory and it has been developed over the last two decades. According to this theory acupuncture vessels are organizational networks that originate in the embryo before the development of nerves or blood vessels. This organizational network controls the development of the embryo and then persists in the mature organism for the purpose of coordinating information, regulating homeodynamics, and overseeing the balanced and continuous renewal and rebuilding of the body. There is a lot of technical evidence for this theory including a strong correspondence between the well known high electrical conductance of acupuncture points and the high electrical conductivity of embryonic organizing centers. Both areas also have a high density of gap junctions which are cellular organelles that allow increased communication between adjacent cells. “As embryonic development progresses, gap junctions become restricted at discrete boundaries, leading to the subdivision of the embryo into communication compartment domains. These boundaries are major pathways of bioelectrical currents and divide the body into domains of different electrical currents.” * These boundaries develop into “neurovascular bundles” a combination of veins and nerves that lay out the foundations of the bodies meridian pathways. Chinese were able to map out these pathways by working with individuals who have sensitive reactions to acupuncture stimulation. Further analysis and careful dissection has lead to a deep understanding of their relationship to internal organs and the circulation of blood and energy in the body. At the beginning of embryonic development these networks are folded over on each other like a child’s cut-out paper snow flake. When fully developed the networks still have a strong balancing relationship with each other. This helps explain why a point in the leg can treat a problem in the shoulder. The genius of Chinese Medicine is that these complex relationships have been so clearly mapped out and passed down through generations of scholarship and teachings to give us the insight we need to treat patients with contemporary diseases today. What are these networks? Can they be located in the body? Yes, there are anatomical structures that correspond to acupuncture meridians in humans and other mammals. This is where things start to get really interesting. A North Korean anatomist named Bonghan Kim discovered them in the early 1960's but, because he did not reveal the histological dye staining technique which he used to make them visible, very few scientists were able to confirm his discovery. In 2002 researchers in South Korea directed by Kwang-sup Soh began reinvestigating these structures which are now called the Bonghan System using modern micro-anatomical methods. 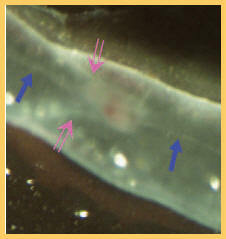 This recent microphotograph shows a white, thread like Bonghan Channel (blue arrows) inside a lymphatic vessel. Pink arrows point to the structure of a lymphatic valve. Source: Hyeon-Min Johng, et al. Use of Magnetic Nanoparticles to Visualize Threadlike Structures Inside Lymphatic Vessels of Rats, Evid Based Complement Alternat Medd. 2007 March; 4(1): 77–82. The Bonghan System consists of fine, threadlike structures that are found under the skin, inside of blood and lymphatic vessels, and also forming web-like networks on the surfaces of the internal organs. The Bonghan channels are filled with a circulating fluid that includes microcells containing DNA molecules which, like stem cells, are capable of regenerating damaged organs and tissues. Furthermore, the DNA in these microcells may be capable of emitting laser like coherent light called biophotons which would allow for the communication of incredible amounts of information at the speed of light. This biological fiber optic network would have the capacity to manage the organizational complexity of embryonic development and the ongoing repair and maintenance of our body that keeps us healthy in spite of demanding physical and emotional stresses.